A WSU Tri-Cities civil engineering team, armed with a new $300,000 grant, is pursuing a cost-effective, sustainable grout to contain contamination at the Hanford nuclear site. DOE lecture looks at the impact of earthquakes, floods, volcanoes, and high winds at the Hanford Site, and how they prepare to withstand them. PULLMAN, Wash. – The role of university research in national security will be discussed by the deputy administrator for defense nuclear nonproliferation for the National Nuclear Security Administration (NNSA) at 3:30 p.m. Monday, Oct. 17, in the Goertzen Hall atrium at Washington State University. 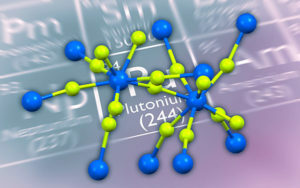 RICHLAND, Wash. – A Washington State University physics instructor and undergraduate have taken part in a study aimed at getting a better understanding of plutonium, a complex element with far-ranging applications in the fields of energy, security and the environment. PULLMAN, Wash. – A first-of-its-kind-worldwide research capability will help unravel the mysteries of material behavior at extreme conditions and short time scales in support of the National Nuclear Security Administration’s vital national security missions. PULLMAN, Wash. – A new radiochemistry trainee program at Washington State University will help address a critical shortage of scientists in the nuclear energy industry. PULLMAN, Wash. – Washington State University in Pullman will launch a new training program in radiochemistry with the help of a U.S. Department of Energy grant. RICHLAND, Wash. – What happens when your small company is acquired by a big company, but then it turns out that size matters and small is better?